Aubrey slept the entire time. I certainly didn't expect her to, but apparently the little baby girl sleeps "23 hours a day". And she really was little. Even at 4 weeks old, she only fit into her very limited selection of newborn clothes. 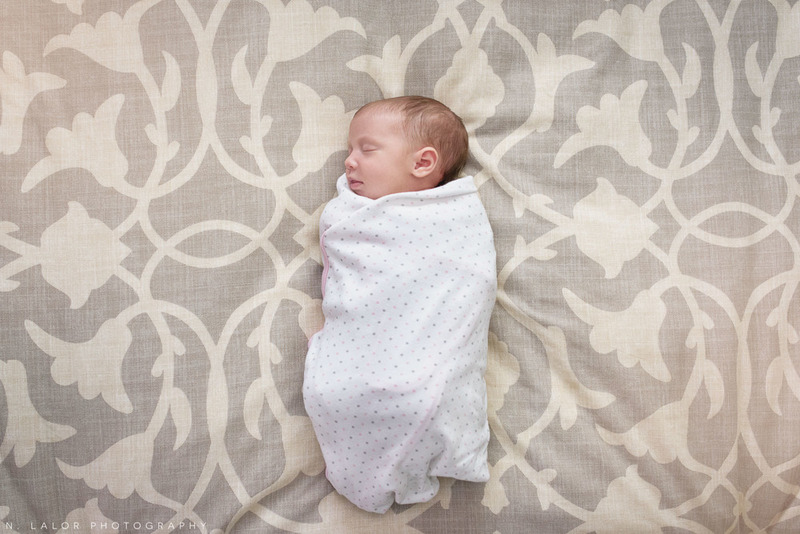 So we did what any photographer faced with un-coordinating baby outfits would do, we swaddled her.. which, I'm guessing probably only helped her sleep through the proceedings. And of course, there were Aubrey's parents. Both teachers at the same school. Both so nice and quite good-looking themselves (I don't know how I get so lucky with my clients). And absolutely willing to trust in my ideas and direction. It helped that Mom was familiar with my work and I got a glowing review from her sister (Thank you!). The entire session took about an hour and twenty minutes.. and that's including the wardrobe and room staging before any actual photos were taken. I tend to move through rooms and poses fairly quickly. 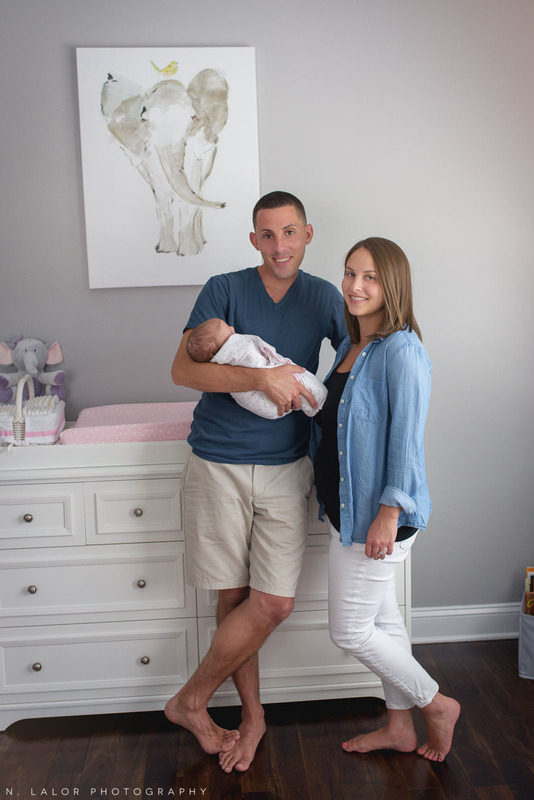 And since Aubrey never cried (she was held by her parents most of the time, after all) or woke up, we were able to photograph fast, using four rooms: her gorgeous baby nursery with an elephant theme, parent's bedroom (such a pretty bedspread! ), living room (dramatic light), and guest bedroom with lovely blue walls which was perfect for simple "studio" portraits. The session was over before anyone had a chance to feel self-conscious. There were even some laughs and actual enjoyment from the parents (crazy, right?). 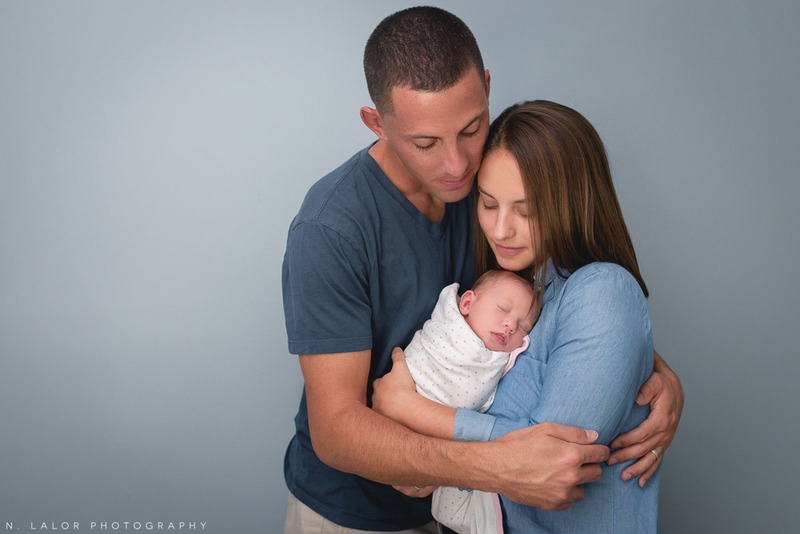 Looking at these photographs, you can plainly see how loved Aubrey is by her Mom and Dad. They gaze at her, hold her, and cuddle with their little baby girl. They will have these images forever.. and when Aubrey grow up, she will have photos, not of just her as a baby, but also of her parents. She will know what they looked like when she was just born, and that, my friends, is priceless.